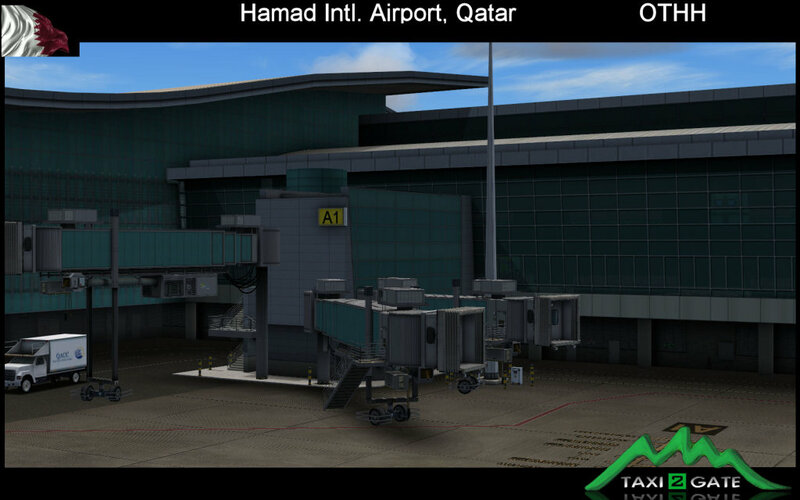 thank you Taxi2Gate for continuing to support FS2004 users with beautiful airport. i could not believe that so detail they make. i hope this suggestion could make an update. I just purchased OTHH for FS9 and I am here to tell you....BUY IT! Unbelievable realism and quality was put into OTHH. Taxi2Gate has done it again with another 5 star winner!!!! This is scenery is FlyTampa quality. I don't know think that group could do better. I appreciate that Taxi2gate is still supporting FS2004 and the price is well worth it with the quality of the scenery they are releasing. It is always nice when a scenery group creates a skyline to go along with the airport. It is great to land and pan to the side to see the city day or night just before landing. 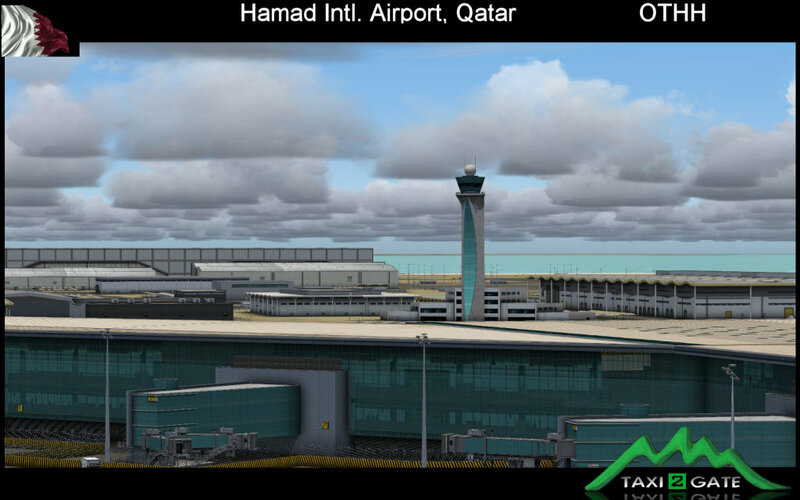 I know that this group has not yet released a FS2004 version for the Istanbul airport, but if they do, Ill buy it to go along with all of the other FS2004 sceneries I have purchased from them. My machine will support FSX however I did not like FSX and decided to go back to fs2004. 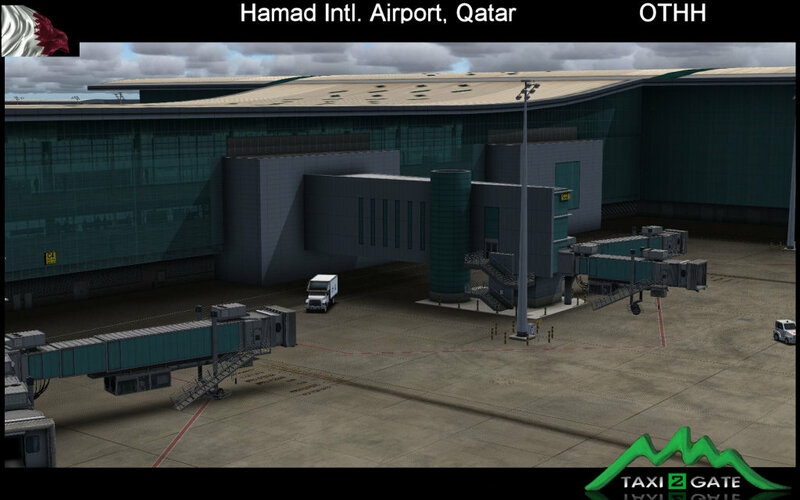 TAXI2GATE Group,,,THANK YOU for this stunning FS2004 scenery from a part of the world I'm sure has not been represented in this capacity before.!!!! 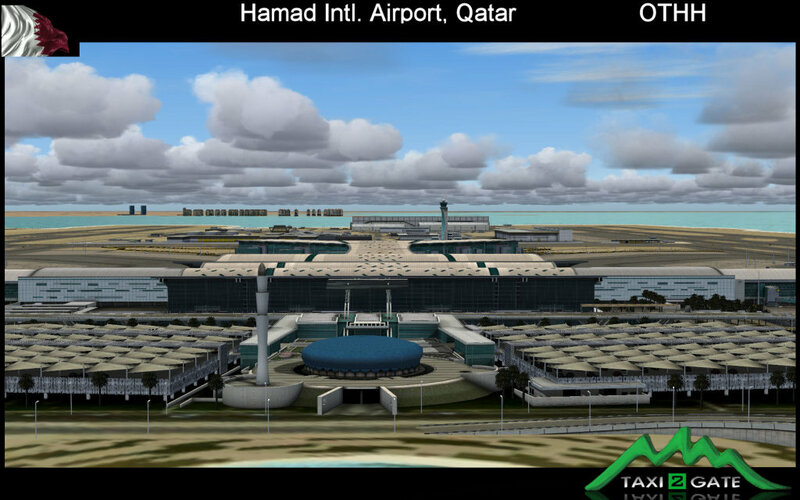 Review of the New Doha International Airport (OTHH) for FS9 by TAXI2GATE. Review system - E5400 Dual Core CPU, 2GB Dual Channel DDR RAM, 1TB 7200rpm main hard disk, NVidia 8800GTS 2GB Graphics card using FS9.1 on a Windows XP Pro SP3 OS. Time spent examing the product - three hours. International Airport in a country many people know practically nothing about! standard download and is installed by running the scenery EXE install file contained within. The product installs effortlessly into the default FS2004 install location (C:\PROGRAM FILES\MICROSOFT GAMES\FLIGHT SIMULATOR 9\) but the install can be re-directed to a different location if you have FS installed elsewhere. Note that unlike the previous ORLANDO KMCO product mentioned above, there is NO MANUAL included with the release of this scenery. 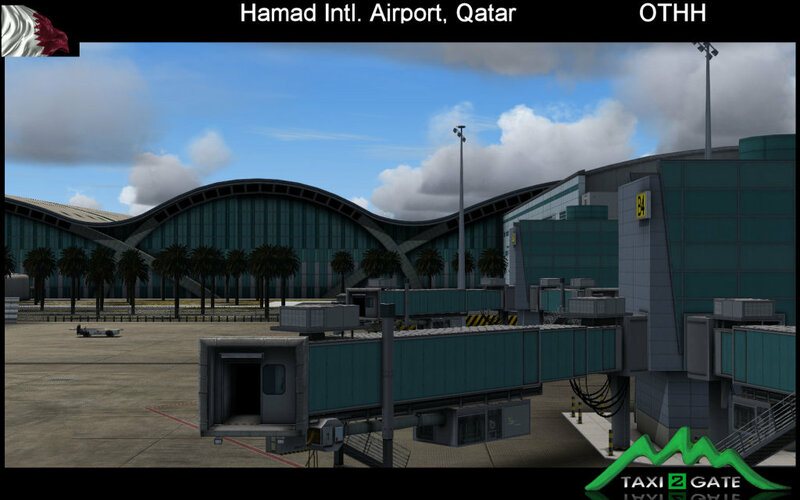 When firing up New Doha International Airport for the first time in FS9, my impression of the place generally is that it is excellent. I find a really nice airport, complete in almost every detail. 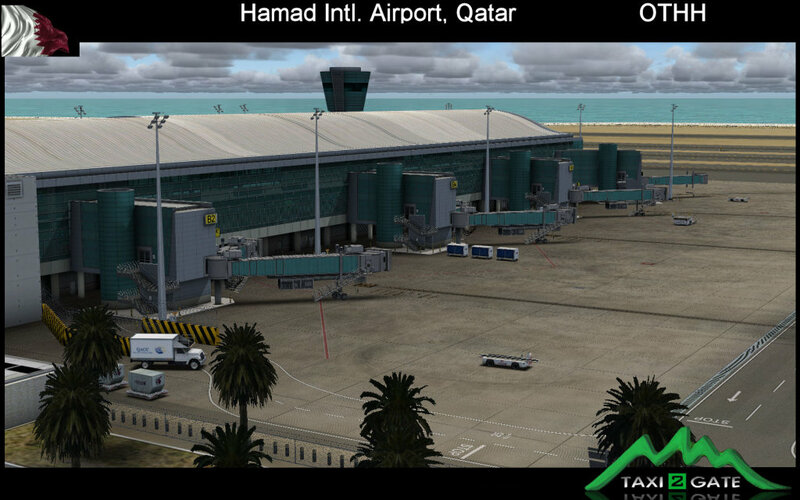 The scenery does lack the depth of the KMCO product in that little or no photo-scenery or landclass additions seem to have been included, (unlike in the FSX version) but what it lacks in this area is more than made up for by the sheer quality of the texturing work on the airport itself. 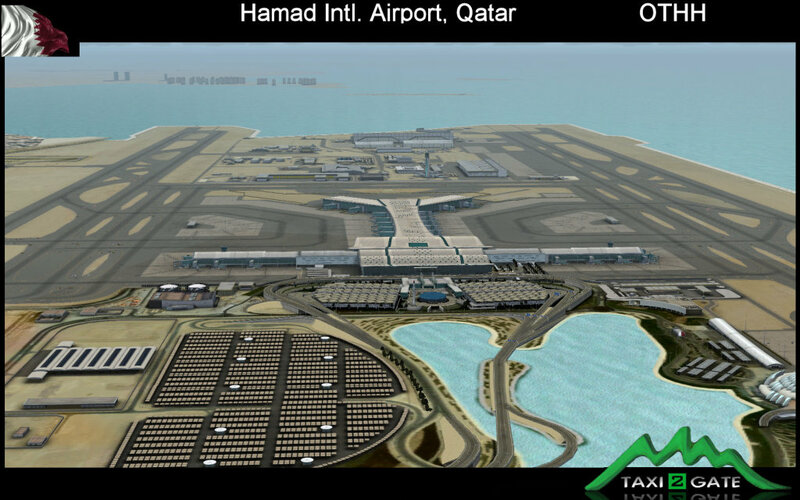 Runways, taxiways and aprons are highly detailed with skid marks and oil marks all over the place. This really gives a sense of reality about the ramp generally. 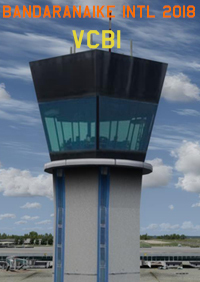 Add to this, the main Terminal area is constructed to a very high standard with gates and jetways, signage and ground markings, all highly detailed. The terminal features a see-through glass effect with passengers visible inside. You really need to sit on the apron and just take in the sheer classy way it all looks! The thing that does it for me is the shading and shadow work which really makes the place come alive. I taxied around the whole airport looking at even the smallest buildings and roadways - the same detailed work can be found everywhere. I must say that I also admire the way the desert sand is displayed within the airport environment as well. Outside of the airport, the famous PEARL landmass is there and some buildings have been included, but it is a rather simplified piece of scenery and serves perhaps as a landmark only which can be seen on the approach to runway 16R. 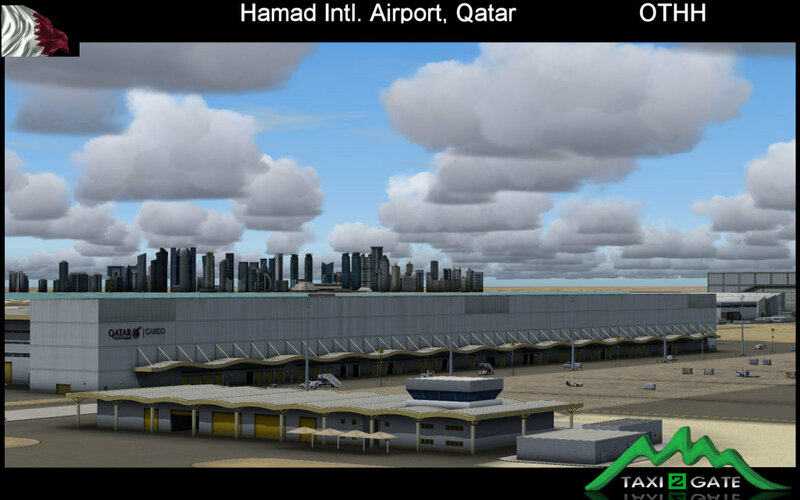 The city of Doha and its high rise buildings have been included and they are of a slightly better visual quality and sit on a more detailed area of land, but the area outside the airport, overall, is not detailed to the same high standard as the airport itself.  You can perhaps forgive them for this since the product was released quickly to get it to market and perhaps updates such as those I mention here, could be added later. 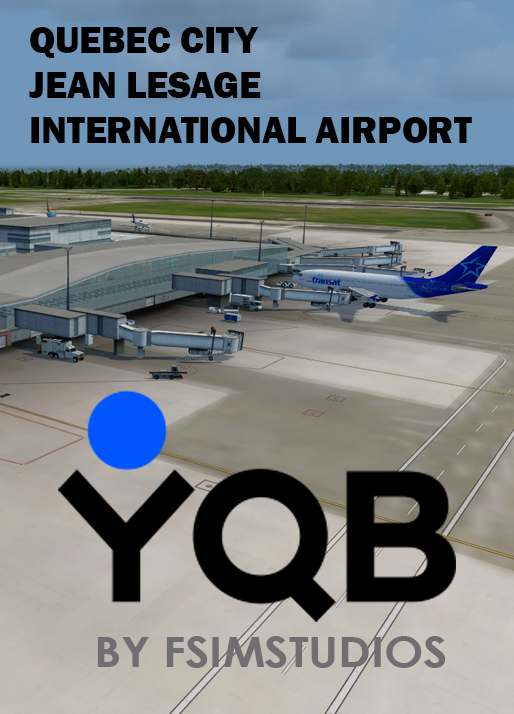 Nevertheless, make no mistake - you get an entire new airport, which is miles better than the default and in my opinion, much better than anything else available currently. Additionally, the airport is very well lit during the darkness hours and you should see the place at dawn, dusk or at night. The taxiway lighting is nice to see and the bulbs, part of the edge lighting, are very detailed. Taxiway signage around the airport is awesome and even the signs are shadow textured, giving them a certain rustiness! forecourt - complete with road signs above the lanes! Although the airport does have hundreds of static vehicles and objects all over the place from baggage trucks to aircraft tugs, vans and mobile stairs, it would also be nice to see some dynamic scenery. I think the scenery is very good however, not perfect. I have also noticed disappearing ground textures, which was obviously caused by incompability of this scenery and scenery of OTBD from MSK. 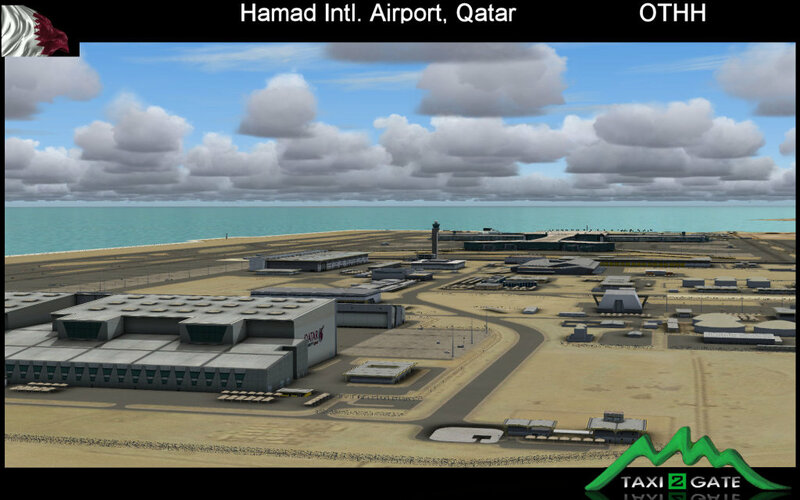 That is a pity since MSK Doha is not so good scenery on one hand; on the other hand the MSK surrounding area like harbor, city centre and close islands is better than that of T2G. Another strangeness is weird OTHH AFCAD. 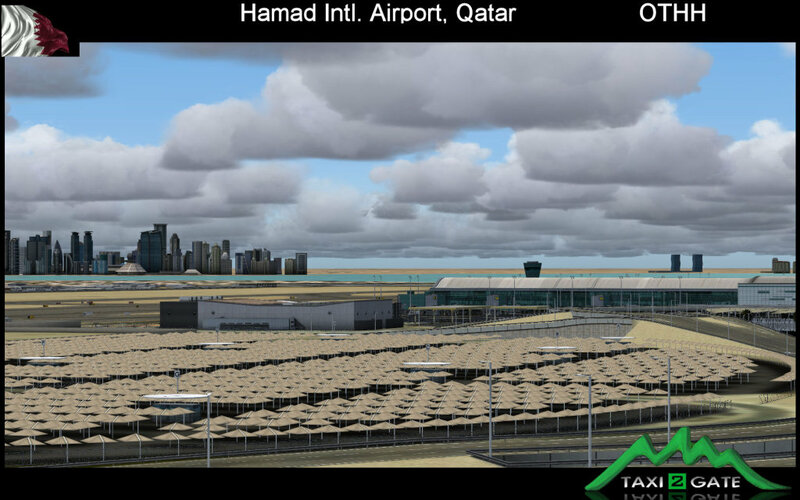 All parking spots oriented to the big terminal are dedicated to Qatar airways only and are "Gate Medium", which I guess does not correspond with reality. All in all, the scenery is very good and I do believe that T2G will correct the small imperfections soon. It is great that T2G still supports the fs9. But I have very mixed feelings about this scenery. The Buildings look good and realistic. Nevertheless I have a strange feeling of something very abandoned and unfisnished. T2G charge 29 EUR for a scenery which is the same as the FSX version - but it is miles from that one. 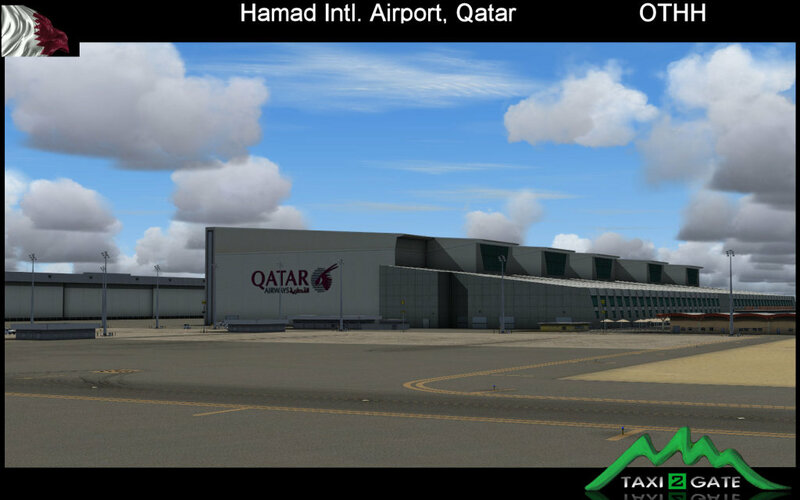 Latinvfr made TJSJ for fs9 also more simple than the FSX version but the Price were also lower. Compared to KMCO for fs9 this is also far from that regarding quality. 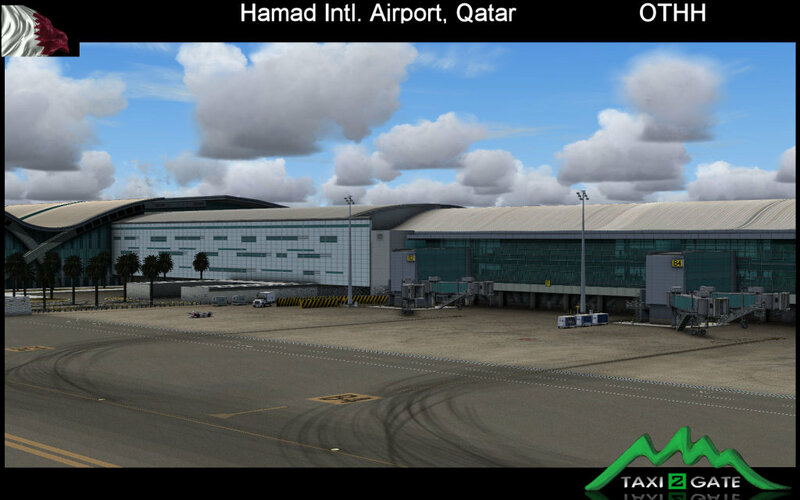 T2G has made a lot of very nice fs9 sceneries but this one is weird and not up to todays standard. I have also an issue the bleeding ground textures that disappear from certain angles. I guess there will an update for this so it is a minor thing for me. I know that negative reviews could mean the end of fs9 sceneries for T2G. That is sad because they have a lot of potential. d to KMCO for fs9 this is also far from that regarding quality. 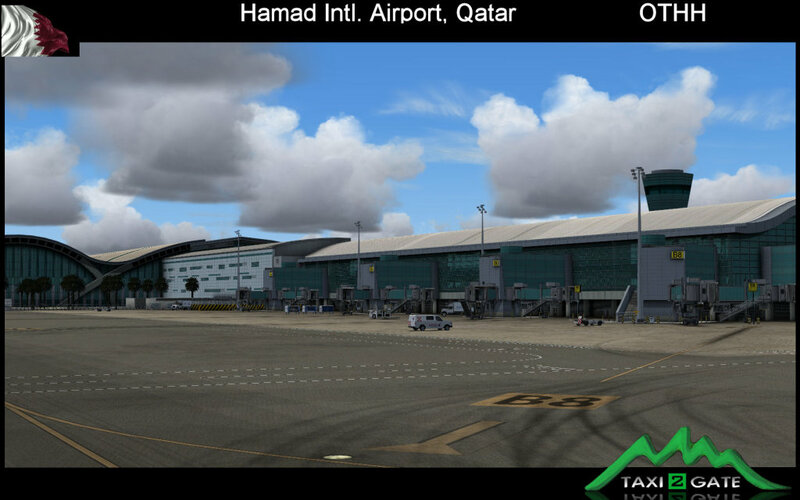 T2G has made a lot of very nice fs9 sceneries but this one is weird and not up to todays standard. I have also an issue the bleeding ground textures that disappear from certain angles. I guess there will an update for this so it is a minor thing for me. I know that negative reviews could mean the end of fs9 sceneries for T2G. That is sad because they have a lot of potential.